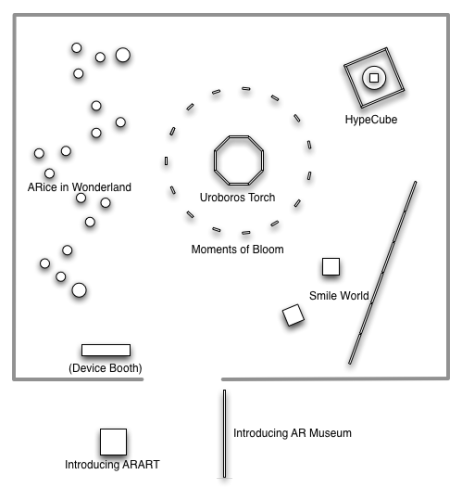 “AR Museum – Seeing Objects Moving” is a media installation exhibition that was held at ICC in Tokyo, Japan in 2013. 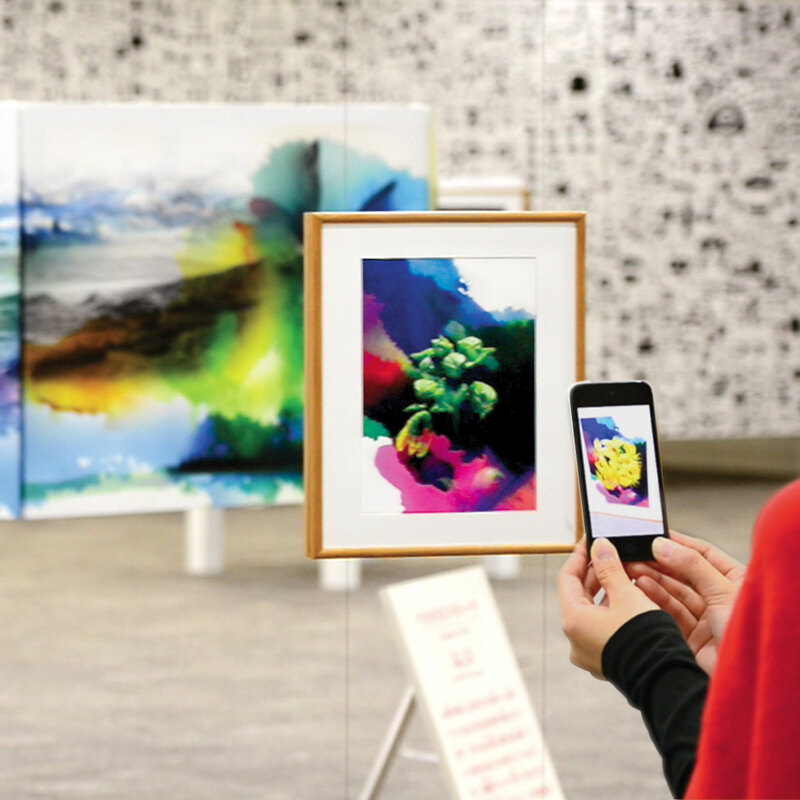 Several artworks using a new type of AR (Augmented Reality) technology were shown there. Visitors could see paintings and objects changing via mobile devices, such as an iPhone. For example, in “ARice in Wonderland”, there were seventeen cylinders on which illustrations of the famous children’s story were printed. The illustration would begin to move and the story would be spoken when a device was held up to it. At that time, visitors could feel that, like the derivation of animation, life was breathed into a still object, and the confined story thawed and flowed into the real world. In the same way, “Moments of Bloom” consists of thirty paintings of various flower buds and, as you look at them, they bloom into lovely flowers. The blooming of the flowers was shot with time-lapse photography, so we can see the energy and transience of the flowers’ lives. For “Uroboros Torch” there were eight serial paintings which showed the workings of man and the flow of nature. They also manifested the antagonism between art and idleness, as well as a circularly cycling eternity. Furthermore, in “Smile World”, wall paintings and objects are covered with numerous small characters. Visitors are able to find hidden big characters, just like a treasure hunt. And “HypeCube” is a three dimensional cube on which a four dimensional hypercube would be projected, allowing us to feel strange and marvelous movements in a hyper dimension space that does not exist in our real world. As mentioned above, these artworks are not augmentations but transfigurations of the real world. We would like to call this concept “Alternated Reality”, with the same initials as “Augmented Reality”, and call this technology “ARART” (AR + ART). Our aim is to produce a new sensibility and viewpoint by naturally melting virtual information into a real phenomenon. Incidentally, although it was said that the real world would be changed, you might think it’s nothing more than a visual effect on the screen. However, with “HypeCube”, when the virtual hypercube moves, it is based on the actual movement of the real cube. That is because, once the mobile device detects the cube, its inner motor and wheels start moving. You may think it a trick but it can be said that it suggests the activities of our present or near future. This is because, just by manipulating information on a screen, we are moving a real object. The book you ordered on Amazon should be delivered to your house the next day. Car automation and home automation are possible, and in the near future, real objects will likely actually move around via nanotechnology. In other words, this exhibition shows that we are living in a world where virtuality and reality have mixed together.